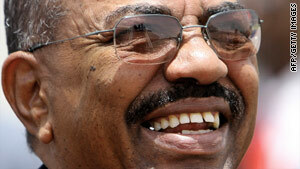 Sudanese President Omar al-Bashir's election was marked by accusations of voter intimidation. (CNN) -- Sudanese President Omar al-Bashir was to be sworn in for a new term Thursday amid an outcry from human rights groups over his international war-crimes indictment. Al-Bashir won the country's controversial but historic presidential election with roughly two-thirds of the vote, the nation's election commission said. The elections were the first in 24 years in the oil-rich African nation, which has seen deadly violence in Darfur and a civil war between north and south. International observers, including the United States, criticized the elections and said there were irregularities in many parts of the country. White House press secretary Robert Gibbs said intimidation and threats were reported in south Sudan. The ongoing conflict in Darfur also made it unfavorable for voting, he said. International human rights groups have called for a boycott of the inauguration. Last year, the International Criminal Court issued an arrest warrant for al-Bashir over alleged war crimes and crimes against humanity in Darfur. Hundreds of thousands of people have been killed in the region, one of the world's most desolate, as minority rebels battle the Arab-dominated government. The incumbent president has defied the arrest warrant, the first ever issued by the ICC for a sitting head of state. Al-Bashir has traveled to several countries since the warrant was issued, even though any country that is party to the ICC has an obligation to hand him over to The Hague. New York-based Human Rights Watch said governments committed to justice for Darfur should skip the inauguration. The group decried plans by the United Nations to send a representative to the ceremony. "U.N. guidelines limit U.N. interaction with individuals indicted by international criminal courts such as President al-Bashir to what is strictly required for carrying out UN mandated activities," Human Rights Watch said in a letter to U.N. chief Ban Ki-moon. "Attendance at the inauguration cannot be justified as strictly required." The election was a key part of a 2005 peace deal that helped end decades of civil war between the country's north and south -- a different conflict from the one in Darfur. The south-north conflict pitted Christian and animist southerners against Muslim northerners, leaving more than 2 million people dead. The peace deal also called for a referendum next year to determine whether the south should become an independent nation. Salva Kiir was elected president of southern Sudan, a semi-autonomous region scheduled to vote next year on whether to become independent.